Prepare Payroll, Print checks, Pay Taxes & File Tax Forms as easy as 123! Prepare Sales and Use Tax as easy as 1.2.3! Never compute Sales and Use Tax due again! There is no need to search for a tax rate. plus nontaxable sales and other deductions. You are done. CSUTax will do the rest! 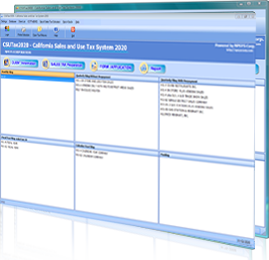 Click Quick Sales Tax Calculator at task bar to open the worksheet. 2. Enter Sales Tax Rate. If you do not know the tax rate, enter CITY+ZIP CODE. CSUTax will locate its current tax rate. You will have results of the other 2 sections in a second. 4. Add applicable Nontaxable Sales (line 4-8). Click Add and repeat if additional items need to be added. When you finished, click Save & Close. Click on Print to view and print a report. Click on Clear to re-enter new data.  Quick Sales Tax Calculator is only for a business with single district tax area. Other type of business such as multiple district tax areas sales, vending sales, chain stores, chain restaurants, Gas Station needs to purchase our full version.  To print an E-filing report or paper tax return you need to purchase our full version. NEVER COMPUTE SALES TAX DUE AGAIN!  Enter retail merchandise sales including tax on line R1.  Or taxable sales without tax on line 12.  Add nontaxable sales and other nontaxable deductions on line 4-8 & 10.  Open Vending worksheet from Sales Tax Calculator worksheet.  Just enter Total sales including tax on each type of vending sales such as Food Sales 100% taxable sales, 33% taxable sales... on worksheet. Having 2 or more sales locations?.  Add nontaxable sales and other nontaxable deductions on line 4-8 & 10 for each location. Gas station. (401-GS) single or 2+ locations (401-GS + sub-outlets) (with Vending).  Add non taxable sales and other nontaxable deductions on line 4-8 & 10.  Add MV fuels including tax, Diesel fuels including tax.  Enter gallons of Diesel fuels sold (State excise taxes are exempt from sales tax).  Enter gallons of Motor Vehicle fuels and Diesel fuels bought (Get credit for sales tax prepaid to fuel suppliers).  Enter tax prepayments paid for the tax period. You are done! A trade show business with multiple district tax areas sales. (401-A + Sch. A & B). Having one permanent location and multiple district area sales?  Just enter Total taxable sales without tax on line 1-Total (gross) sales on main worksheet.  Enter taxable sales without tax for each city or county on Schedule A worksheet. After you entered the above sales transactions. Stop! You are done.  CSUTax will calculate and transfer all sales data and applicable sales tax and tax due to tax form and its schedules based on business's city & zip code and tax periods. ° Click "Print" to view/print the worksheet. ° Click "Transfer data to main worksheet" to view/print a tax return. 1. File online: Click "E-filing Report" to print a report and use it to transfer line by line to BOE E-filing online. 2. File paper tax forms: Click "View/Print Tax Return" to have paper tax forms to send it to BOE.  A business having one location, one district tax area sales.  A business having multiple locations, chain stores, chain restaurants.  A business having multiple district tax areas sales.  A Vending Machine Operators Sales. Copyright © 2019 by NPSYS Corporation. All right reserved.